[SatNews] One of the main reasons to attend the Space Foundation's 30th Space Symposium is the dynamic Boeing Exhibit Center, featuring the world's latest space technology, products and services—for 2014, the Boeing Exhibit Center has sold out, with 35 first-time exhibitors. The Space Symposium is the premier annual gathering of the global space community. Scheduled for May 19-22 at The Broadmoor Hotel in Colorado Springs, Colorado, USA, the Space Symposium brings together all sectors of the worldwide space community to address opportunities and issues. The Boeing Exhibit Center will open Monday evening, May 19, immediately following the Space Symposium's opening ceremony, and will be open through Thursday, May 22. Exhibits are displayed in two halls—the Boeing Exhibit Center in Broadmoor Hall and the adjacent Boeing Exhibit Center Pavilion. 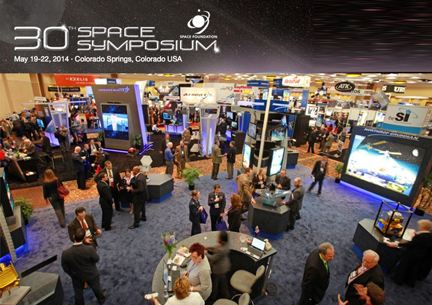 A wait list is in effect and exhibitors are encourage to plan now to exhibit at the 31st Space Symposium, also to be held at The Broadmoor, April 13-16, 2015. The thousands of people who tour the exhibits include C-level industry executives, senior decision makers and government officials. Contact Exhibitor@spacefoundation.org.